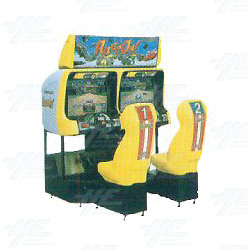 Race On is a driving game from Namco. It features a variety of different tracks and scenery, including off road, underground, and suburban tracks. The machine also has a camera which can take a photo of the player. The image of the player is then superimposed over the top of their chosen car. The machine also has a camera which can take a photo of the player. The image of the player is then superimposed over the top of their chosen car.